Hitch And Sully: Is Religion Fossilized Philosophy? H: One can’t be neutral about religion. One can’t just say it’s wrong — one has to say it’s a wicked thing to desire. I mean, why would anyone want it to be true that one was subject to permanent round-the-clock supervision, surveillance, and possibly even intervention, all of one’s waking and sleeping life? And one couldn’t escape it by dying. It’s worse than any kind of totalitarianism; it means you’re absolutely held as property, that you have no autonomy, that you throw yourself permanently on the mercy of somebody. That is the description of the servile condition; that’s why both Islam and Christianity were both perfectly adapted, and still are in many ways, to feudalism or absolute monarchy, which of course is one of feudalism’s counterparts. H: Yes, but only by snipping out, or razoring out, every single supernatural or immoral claim. It left him with, as you know, a very slender volume. And even that he didn’t dare to publish. And I think that if he had been in a position where he did dare to publish – and this is after his retirement from public life – if he felt free to say what he freely thought, I’m confident that he would’ve been at the least, or most, a deist. No more than. Certainly not a subscriber to any one monotheism. And in his braver moments, I think it’s very clear from his correspondence and his reflections that he’d had the experience of being an unbeliever and had not been able to forget it. A: But a lot of people of faith have had that experience. A: There’s also this, that if you strip religion of dogma, i.e. its big empirical truth claims…If one understands mystery to be the core of it — in other words that one is worshipping something one cannot understand, which requires a certain letting go of it — its best expression is something like ritual. Wordless. Then it’s reconciliation to immortality. H: Then you end up where Simon Blackburn — a professor of philosophy at Cambridge, author of a very good recent study of Plato. He puts it: religion is fossilized philosophy, it’s philosophy with the questioning left out. It’s something that becomes instated and no longer subjected to any further philosophical inquiry. Well, why would that be, from any point of view, a desirable thing? H: It’s the only thing that helps one live. A: No, it’s a recognition that at some point there are some things that are beyond our understanding and an acceptance of that. And there is a content to that acceptance that can vary from faith to faith. A: It can be. But there are differences in degree and kind in religious experience. The kind of thing you’re talking about I would understand as a fundamentalist version of religion. But I absolutely refuse to believe that is the only form of religion imaginable, or the only form of religion that actually exists, or the only form of Christianity that exists. 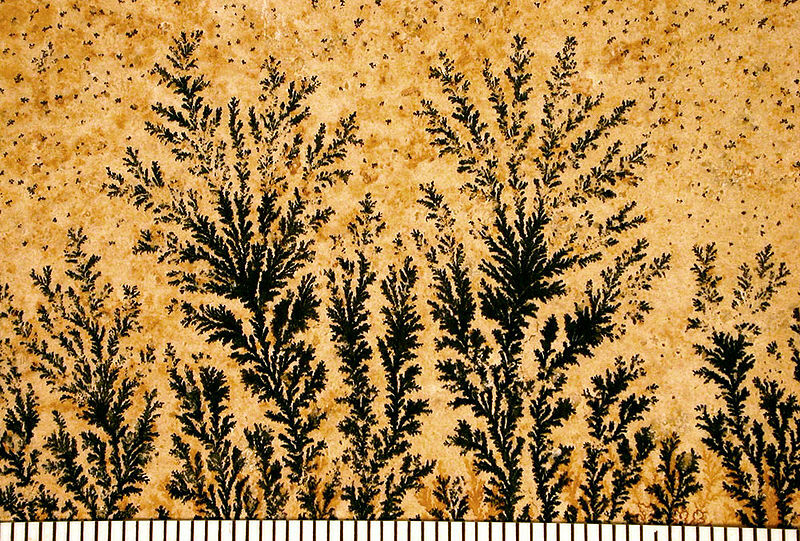 (Photo: Manganese oxide dendrites on a limestone bedding plane from Solnhofen, Germany. Via Wiki).